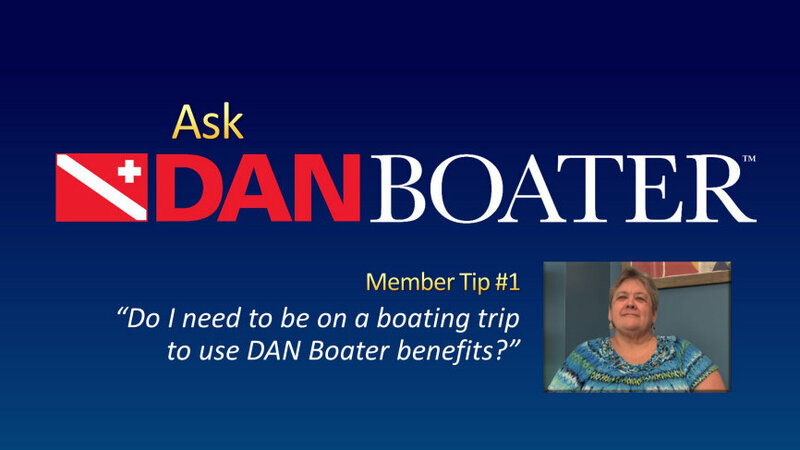 ﻿ Do I need to be on a boating trip to use DAN Boater benefits? Do I need to be on a boating trip to use DAN Boater benefits? DB: We're here with Frances Smith, veteran emergency hotline medic here at DAN, for a quick tip on when you can use DAN Boater resources. Frances, let me ask you, one of the most common questions we get from potential members is "Do I have to be on my boat, or even boating somewhere, in order to use the DAN Boater services?" Frances: Glad you asked that and the answer is no. You do not have to be on your boat. DAN is available here for you 24/7/365 for any emergency, and that includes both on and off the boat. Just to give you, maybe, a for instance, we've had several members who are off their boats, vacationing in a foreign country, and one lady in particular was injured severely in an accident. We helped her both find local resources and, if repatriation is needed to a higher medical facility, we absolutely are here to help with those repatriation needs. DB: Great! Well, thank you Frances, we appreciate it. Frances: Oh, you are very welcome. It's been a pleasure.